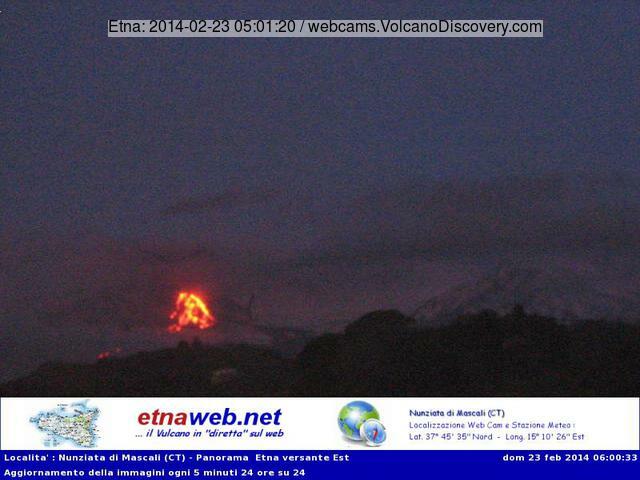 Etna (Sicily, Italy): Activity has remained more or less unchanged. The lava flows from the fissure vents on the eastern flank of the New SE crater continue to be weakly alimented and produce overlapping smaller flows. Most of them only reach only few hundred meters length, and rarely descend into the steeper western wall of Valle del Bove. As a result, most lava accumulates in the less steep area at the foot of the cone. Nishino-shima (Volcano Islands): (21 Feb) The island continues to grow by progressing lava flows into several directions, as the latest images by the Japanese Coast Guard from 16 Feb show. Its highest peak, formed by the western of the 2 active vents, was measured at 66 m, i.e. it now reached almost twice the height of the peak of the old island. The new addition has more than doubled the size of the island so far. It also formed a black-sand beach on the NE shore of the old part, as a result of lava fragments washed up by currents and waves. Sakurajima (Kyushu, Japan): The volcano has increasingly strong explosions. A vulcanian eruption this evening around 23:10 local time (see video) produced an ash column rising approx 3 km and was accompanied by abundant eruption lightning and ejections of lots of incandescent material. Constant ash emissions constant ash emissions (probably from deep-seated strombolian activity) has been following the explosion. Kelud (East Java): (21 Feb) A MODIS hot spot is visible at the crater, suggesting that a new lava dome could be forming there. This would be the effusive continuation of the recent explosion on 13 Feb, as magma with much less gas content continues to arrive at the vent. Activity at the volcano has decreased, but it is still unknown what exactly the situation at the vent is, whether or not a new lava dome is forming there. The thermal hot spot visible on satellite data could also be caused by hot gasses. A picture showing the new crater at the place of the 2007 lava dome has emerged on our friend Øystein Lund Andersen's website, but of course, it is impossible to see what the bottom of the new pit looks like. Sinabung (Sumatra, Indonesia): Activity remained similar to the previous days with an overall decreasing tendency. Dukono (Halmahera): Elevated strombolian, perhaps weak vulcanian-type activity at the volcano continues to produce frequent ash plumes at approx. 2 km altitude. Kilauea (Hawai'i): (20 Feb) Summit tiltmeters record inflationary tilt & the lava-lake level rises again to an estimated 35 m (115 ft) below the floor of Halema`uma`u. Fuego (Guatemala): Strombolian activity remains intense and can now be followed in near-real time on a new webcam. Explosions occur at rates of one every 30 minutes approx. and shower many incandescent material onto the upper slopes, where they generate avalanches up to 2 km length. 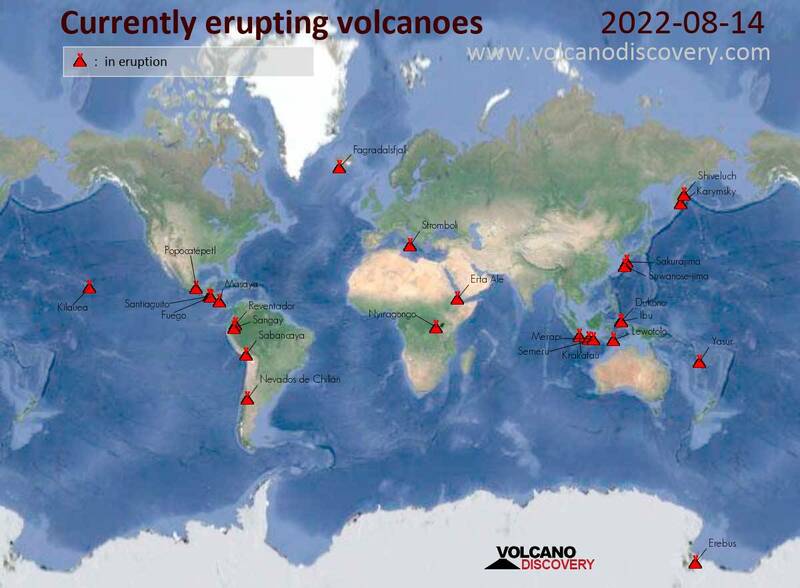 No lava flows, however, is active at the moment. San Miguel (El Salvador): (21 Feb) The situation has remained essentially unchanged and the volcano has (not yet) erupted again. Seismic activity remains high and continues to increase overall, while surface activity consists of pulsating gas emissions reaching a height of 200 m.